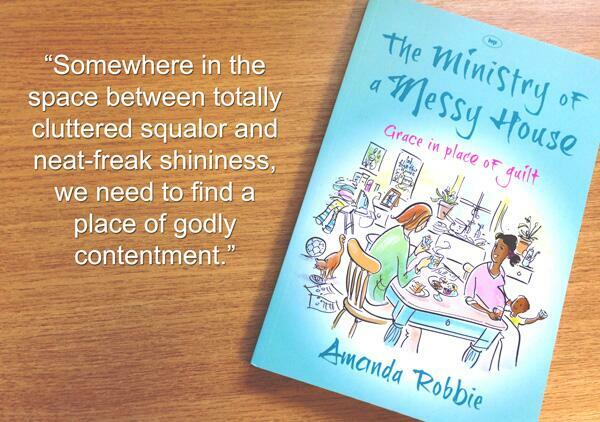 This is a Vicarage favourite (apart from with the Engineer, who has a Thing about fish). Very simple and quick to make, and great with rice or noodles and stir fried veg. It’s loosely based on a recipe from a great little series of recipe books (Periplus mini) I bought in Singapore, but alas unavailable in the UK. These are per person – and are very flexible. I just tend to slosh the soy about and add a bit less juice, then scatter sugar/honey and ginger over. 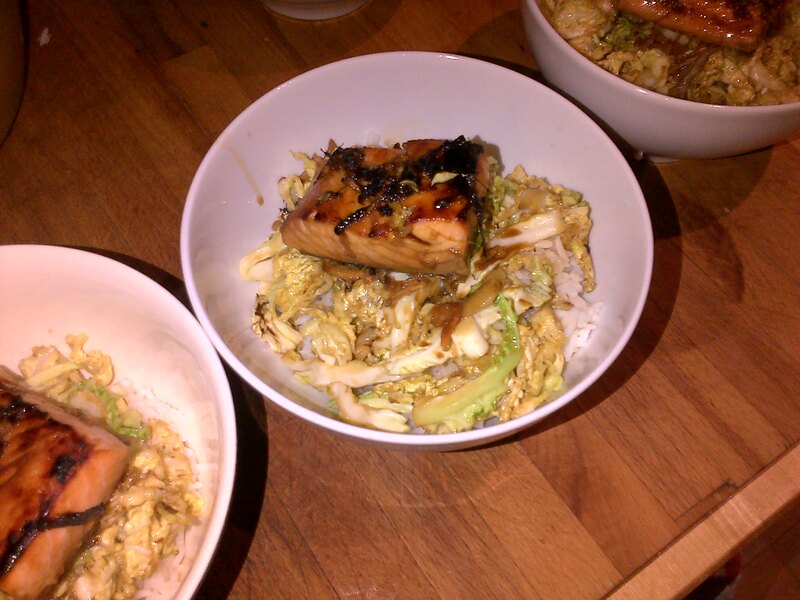 Pop your salmon steaks in an oven proof dish (ceramic or pyrex, not metal) and pour over the sauce ingredients above. Leave to marinade if you have a few minutes, otherwise pop straight under a hot grill for 8-10 minutes, until the fish is cooked through and a little blackened on top. We ate it with steamed rice and some cabbage stir fried with garlic, soy and a little sugar. This recipe is a Vicarage favourite that crosses the seasons – it’s hearty enough for winter, but the light sauce means that it suits a chilly day in June aswell. It’s also speedy, cooking in about 20 minutes. So if you can pre-prepare most of the veg, you can get it on the table within half an hour of getting in from work, or the swimming lesson or whatever. It was swimming for us yesterday – and the Queen and the Joker had to get to Kids Club, fed, in less than an hour after our return. 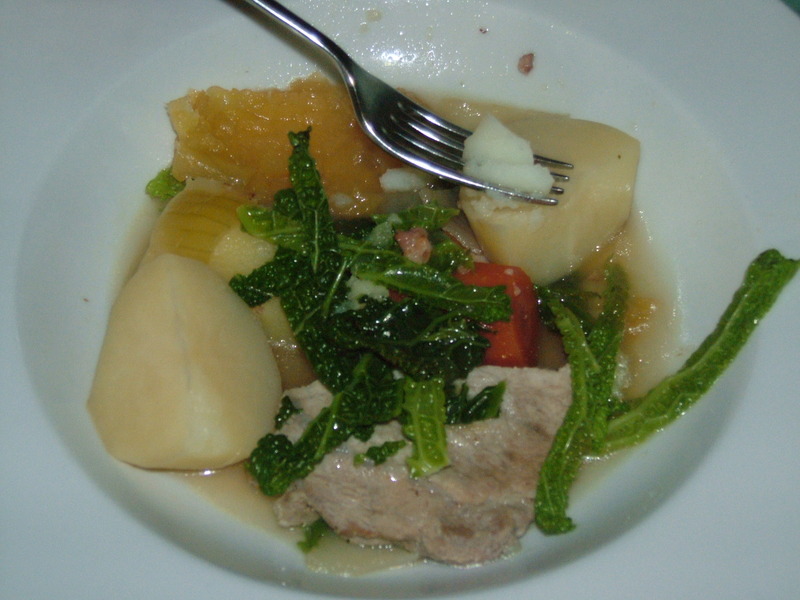 Potatoes and vegetables – select from carrots, squash, sweet potatoes, parsnips, leeks – all chunked. I use a smallish potato per person plus a couple of each of about 4 other vegetables to feed six of us. Using a large pan or cast iron casserole dish, fry the pork in butter to brown and then set aside. Then add the bacon and fry until a little crispy. Then fry the onion until soft and add the vegetables and fry them a little too. Then add cider and enough water to almost cover the veg. Add your bouillion powder and bay leaves and bring the liquid to the boil, then turn it down to a simmer. Pop the pork steaks back on top, cover the pan and set your pinger to 15 mins. After 15 minutes, pop in the shredded cabbage and leave for another 5 minutes or so, until the vegetables are all tender. Serve in soup plates if you can, with spoons handy to slurp up the lovely broth or chunky bread to mop it up if you’re very hungry. Things in parish have been a bit crazy since the new school term began and my blogging habit has rather dried up. But today I’ve just about got my act together and thought I’d share a great recipe for autumn – my mother-in-law’s lentil soup. The Vicar comes from a small town in the Scottish borders with views over heather clad hills and a high street of family run shops. This warming soup is very inexpensive and simple to make and feels like a little slice of old fashioned rural life. Lentils are especially great for those on low GI diets and for diabetics as they are low in carbohydrates and release their energy slowly. 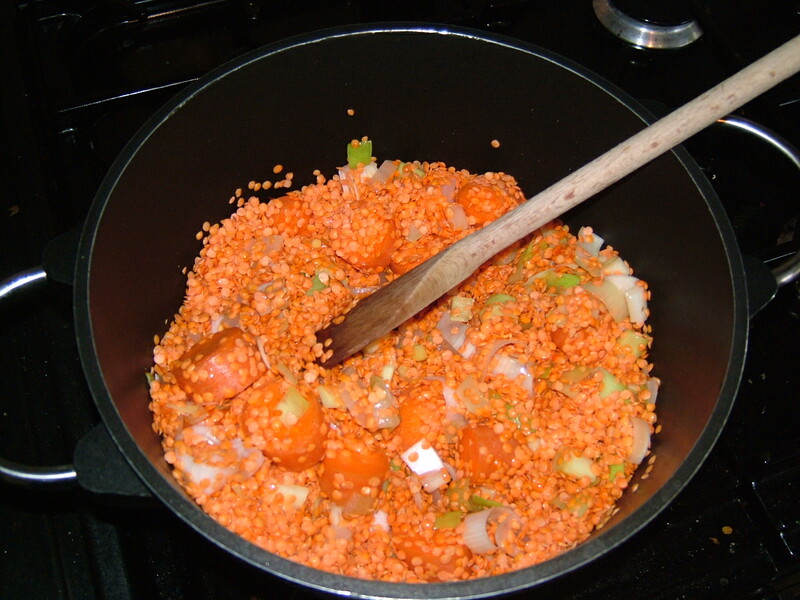 Gently fry the veg until softened, then add the lentils, stock cube and hot water. Simmer for about 20minutes until veggies and lentils are soft. Then use a stick blender to create a smooth soup. If you don’t have a blender, a potato masher will give you a slightly chunkier soup. 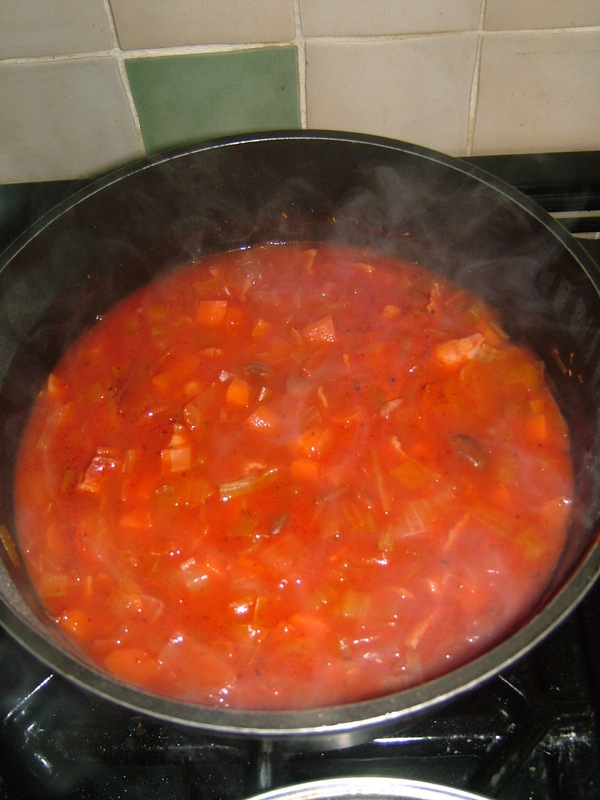 The Vicar likes to add a lot of pepper – no need for salt because of the ham stock. Serve with crusty brown bread if you remember to pick some up. This soup is very filling. I often make a double batch, which fills a casserole dish and keeps us going for Vicarage lunches for most of the week. 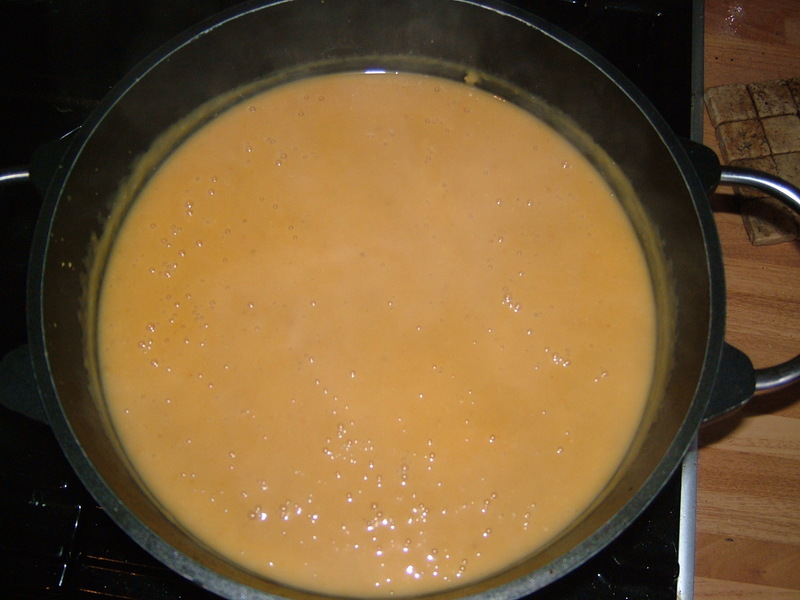 Lentil soup has the strange property of thickening every time it is cooled, so you may have to add a little water on reheating or after freezing. It freezes brilliantly.